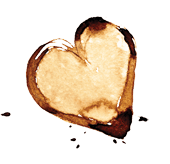 I love making food for my family that tastes good, gets devoured in a hurry and garners praise for my mad cooking skills, even when the item causing so much love only needed to be stirred, dumped on a pan, baked, and cooled. But as simple as this Quinoa Pumpkin Seed Granola is to make, it’s packed full of complex flavors and textures that are anything but simple. And in this case, Dave told me I’d better ration out the granola because it was “tempting and irresistible”. Or was he talking about me and not the granola? Alright, let’s talk about this almost-not-a-recipe. 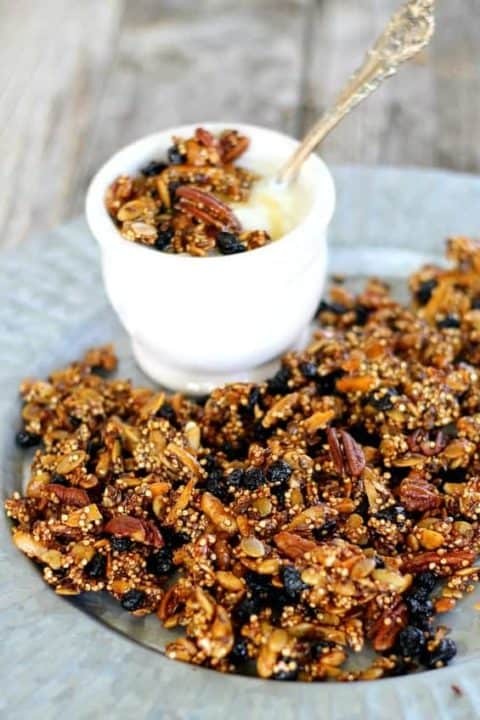 Quinoa Pumpkin Seed Granola is perfect to eat out of hand, on top of yogurt, or over hot oatmeal. Gluten-free, the ingredients can be changed up to your liking but a few stars that should always be at the top of the list are the uncooked quinoa and pumpkin seeds. From there I added pecans and slivered almonds but you could use your own favorite nut combo. Whole flax seeds add even more nutty overtones. I added some dried blueberries that I found in the bulk aisle of my local market but you can use a combination of any dried fruits OR leave the fruit out entirely to save on calories and sugar count in the granola. To bind everything together, use a little bit of honey, light oil, and brown sugar. Again, leave out the brown sugar if necessary and it’s fine to cut the oil back by a tablespoon. Depending on how much you care if it all sticks together, you can cut the honey back by half as well. Just the right amount of cinnamon and coarse salt combine to brighten the granola flavors. This really is a great combination! 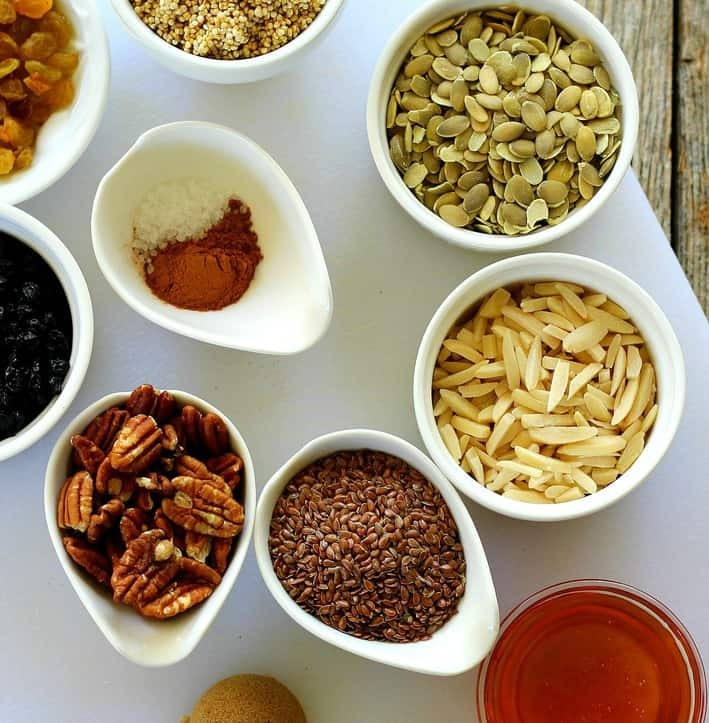 Make the recipe as shown or tweek the ingredients to your own taste but I must expound a little more about the uncooked quinoa seeds that go in the granola. You don’t want to precook it because you obviously want it crunchy; the quinoa gets perfectly roasted in the oven. And the pumpkin seeds, another must have, become magical when roasted. They puff up a little and almost pop when bitten. If you can find dried blueberries, they’re a sweet compliment to the pecans and a great balance for the not-quite bitter seed combination (quinoa, pumpkin, flax). Initially I was going to add golden raisins too but decided a full amount of blueberries would do this time. 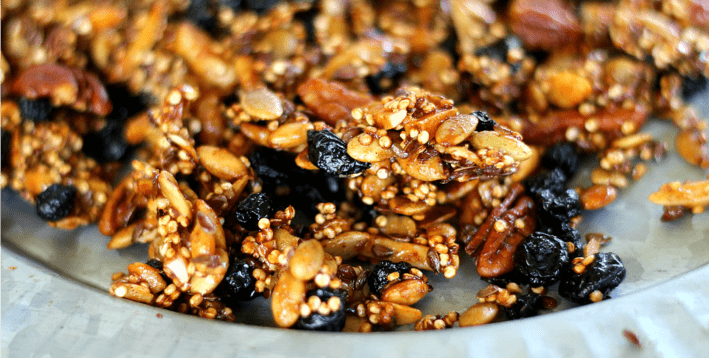 If you want the granola a bit more tart, add dried cherries or cranberries. Great packed in lunches or eaten at breakfast, the granola also makes a pretty gift when placed in mason jars. I’m off to make another batch to ship to out of town family. Thanks friends, enjoy this “irresistible” snack! Preheat oven to 350F degrees. In a large bowl combine first four ingredients (through flaxseeds). In a small bowl microwave the honey until its warm and easy to pour. Stir in oil, cinnamon, and salt. Pour over quinoa mixture; toss to coat. Spread in a 15 x 10-inch baking pan. Bake 20 minutes or until golden brown, stirring twice. Stir in dried fruit. 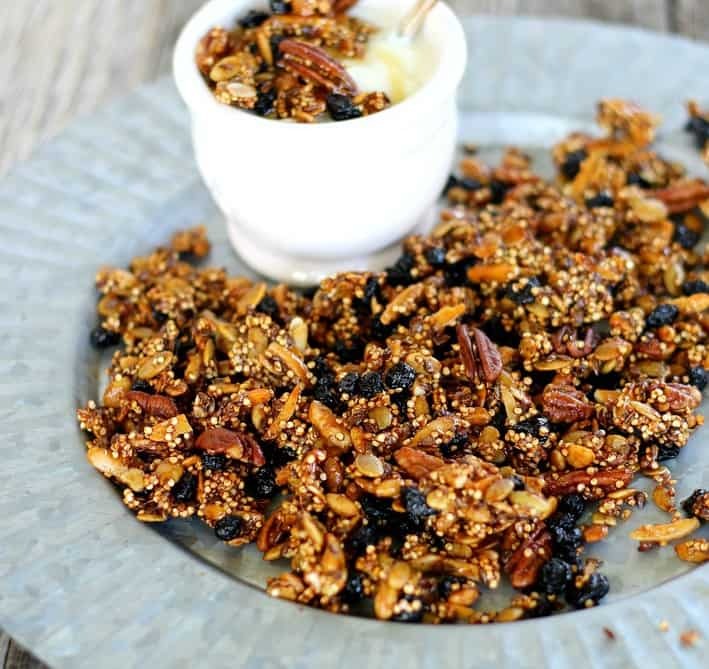 Spread granola on a large sheet of foil; cool completely. Break up any large pieces. Store in refrigerator up to 2 weeks. Recipe loosely adapted from Better Homes and Garden Pumpkin Recipes Publication 2016. Did you say whole flax seed? My understanding about flax is that it is only fiber if it is not ground. The nutrient value is inside the seed, and our bodies cannot break the seed down. Just wondering what your thoughts are if this is the case? Would you still use it? would you grind it? Or would you sub in something else? Hi Jill, you can definitely grind it for the fiber and nutrional benefits. The benefits of whole flax, yes are better ground, but you still benefit from fiber that helps keep you regular when the whole seed is taken in. There isn’t a lot in this recipe for a major source. It would be still very tasty if you used ground flax to maximize the benefits. Good point! Thanks for taking the time to comment. I will definitely make this for my next hike in Runyon Canyon, its just what i’ve been looking for! Hi James, definitely a great snack on any hike but Runyon Canyon must be a beauty in Hollywood. Thanks for stopping by.